When we renovated our little 88 square meter apartment, we opted not to include a washing machine in the kitchen in favor of having more storage space and fewer headaches. When the dirty clothes pile up, we march them downstairs and two doors up the street to La Hormiguita, our favorite laundry of the many in the neighborhood. The laundry is open from 8:30 am to 8:30 pm every day except Sunday and certain holidays. 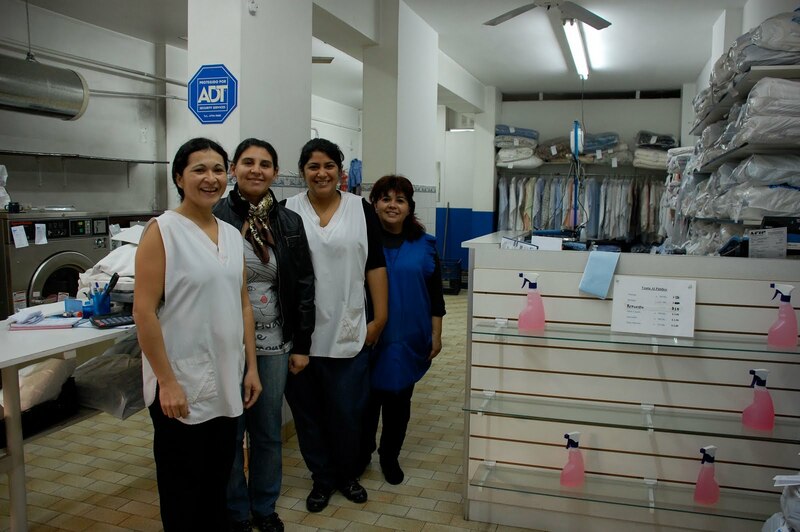 "Las Hormiguitas" (as we call the four friendly ladies who work at the laundry) will wash, dry, and fold all the clothes that fit in one large plastic bag for 14 pesos (about $3.50 USD at the current exchange rate). Much cheaper than buying and maintaining our own machines plus paying for all the washing supplies and the electricity and water. An extra benefit: we get a free "servicio valet" for every seven we pay for. Plus we have a whole set of new friends. In the photo: Sunny, Mariela, Giselle, and Katy (from left to right) right at shift change one day last week. They're always smiling!